There are 3 reviews of Angel Eau De Toilette. While wearing Angel EDT, I totally agree that it shares some similarities with Innocent and Angel La Rose, as bergamot and red berries have a similar masculine edge like in Innocent, and there is also some salty peppery characristics like in Angel La Rose. The transition to the delicious praline is so smooth that I can't really figure out when it peeped out. The red berries are always there with some tartness to refresh the creamy praline. The patchouli can be felt but on my skin I don't find it that fierce like in EDP. The sillage is relatively close and it lasts and lasts, almost 12 hours. It's definitely in the same line of Angel EDP and it's much cleaner and more understated. Although Angel EDT didn't really bring something entirely new, it's no doubt an adorable fragrance. 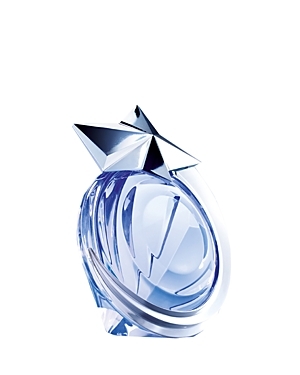 It may not seem to be a necessary for someone who already owns several products of the Angel line, but for someone who's starting his adventure to explore Angel or Thierry Mugler universe, Angel EDT can serve well to open the magical gate. I recently received a sample of Angel Eau De Toilette from the Mugler website, and wore it for the first (and last) time yesterday: I was expecting this to be a less powerful version of the original Angel Eau De Parfum (which I love), but found it to be a different fragrance altogether. I'm afraid I found this to be a mixture of rather sickly, powdery notes, which reminded me of the perfumed sweets (Parma Violets and Cachous) we had when we were kids, against a background of chocolate notes, more reminiscent of A*Men than Angel. Very disappointing, though it might be quite different on someone else. Angel Eau De Toilette reminds me very much of "Classic" by Al Rehab (though Classic does not have the sickly quality), which costs around £2.50 for 6ml of pure perfume oil, on sites such as EBay. Luckily, this sickly fragrance does not share the longevity of the Eau De Parfum (which can easily last 24 hours, and two showers! ), and after three hours was fading noticeably. It had, thankfully, virtually disappeared after about five hours. Angel EDT is not Angel lite. While still bearing the Angel DNA, it has an imprint of its own. I always found that "Angel DNA note" addictive. I would have a strong urge to wear it for that note and then after a short while it would be too much for me and I'd have to stop. Enter Angel EDT. It has that "addictive" note, very lightly, and yet the rest of the scent goes in a different direction, somewhat edgy, airy, a little bit woody and easy to wear over longer periods. It has a moderate sillage and a light mist lasts all day. Best news: a good friend who is highly sensitive to perfume and usually complains about it complimented Angel EDT! Thierry Mugler Angel Eau de Toilette, 2.7 oz. There are no member images of Angel Eau De Toilette yet. Why not be the first?